Baader's New VariLock T-2 Extension Tubes give you complete adjustability to enable you to exactly set or vary the spacing between T-2 components. 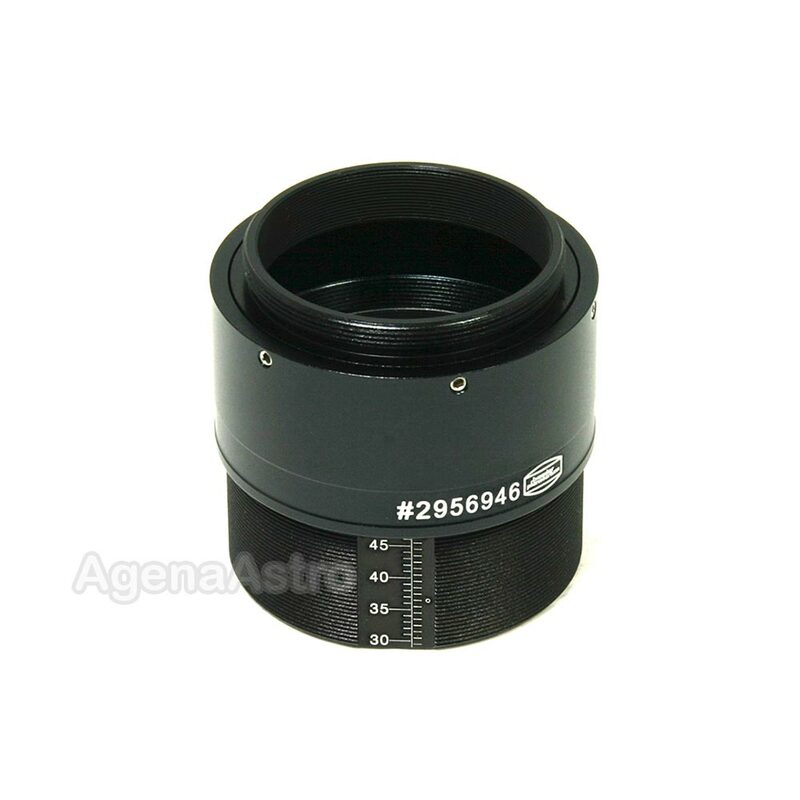 Perfect for exact positioning of reducers, coma correctors, and other optical or imaging system components. The VariLock extension tubes feature an accurately engraved graduated scale for an easy visual determination of the tube length (0.5mm graduations). Simply rotate the inner tube until the desired length is reached, then tighten the lockring with the included spanner wrench. Full internal threading and blackening kills any stray light reflections. 2" OD enables use in any 2" system. The Varilock 46 is also perfectly suited for setting the correct spacing of the new Baader RCC-I coma corrector onto DSLRs (when adjusted to 36.5mm). As an added bonus, the external T-threaded portion can be removed and replaced with a dovetail ring (included) that inserts into standard camera T-rings, for use with DSLRs. 5.0 (Based on 9 Reviews) 100% of reviewers recommended this product. When changing imaging cameras with slightly different back focuses, I was continually looking for various spacers to get the distance 'close'. This well engineered product allowed me to just dial in the new spacing with very little effort. Dialed in the settings I needed and tweaked with dial calipers, beats trying to get combinations of rings to work for my CCD camera. Perfect, allows setting back focus to the optimal distance. Review by Dan of Gaithersburg, MD. I use this to take up the backfocus in one of my imaging setups (an f/4 imaging newt and a DSLR camera), where I use the Baader Rowe coma corrector. I don't use an off-axis guider, so I needed this to take up the backfocus that the OAG otherwise would. Works like a charm, and my field is flat and coma-free. Review by raginar of Rapid City, SD. 5.0 Great, do your math twice! I bought this to use with an ATFF and an ATCC with my new camera setup. Unfortunately, I did the math wrong and it turned out I needed a shorter one. My loss! But, this is an awesome product. It's orthogonal and it's solid! Definitely takes the guessing out of the correct spacing required. The Baader Varilock is the perfect tools when you need a non standard back focus adjustment for you field flattener or focal reducer. It's easy to set and the locking is very strong ensuring that the set length will not change over time. Review by Rob Knox of Brisbane Australia.